Entrepreneurs are usually the ones doing the pitching, talking with investors and customers. But this week, the speakers of the Republican National Convention have been appealing to and promoting entrepreneurs with enthusiasm. Even as Governor Mitt Romney formally accepted the Republican presidential nomination, introducing himself and criticizing President Barack Obama's record, he spotlighted entrepreneurs in a few key moments. First, to illustrate the risks and struggles involved in business, Romney highlighted the fact that legendary entrepreneur Steve Jobs had been once fired at Apple Inc. before he came back to the company "and changed the world." 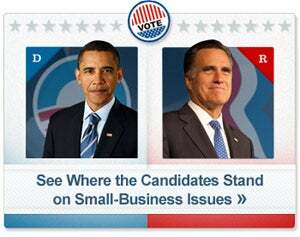 In addition, Romney made small business a key part of a five-step plan to add 12 million jobs. Calling small businesses "America's engine of job growth," he said he would champion small businesses by reducing taxes, simplifying regulations and repealing the health-care overhaul that Obama has put in place. ". . . If you were successful, somebody along the line gave you some help. There was a great teacher somewhere in your life. Somebody helped to create this unbelievable American system that we have that allowed you to thrive. Somebody invested in roads and bridges. If you’ve got a business -- you didn’t build that. Somebody else made that happen. The internet didn’t get invented on its own. Government research created the internet so that all the companies could make money off the internet. The point is, is that when we succeed, we succeed because of our individual initiative, but also because we do things together…"
But this theme hit a snag Tuesday. The party had a Delaware small-business owner, Sher Valenzuela, speak to the convention about her struggles and sacrifices in growing her company. Her story became a controversy when it came out that her business had received government support in numerous cases along the way and also, her soft-manufacturing firm gets a lot of revenue from work it does for Uncle Sam. Related: Are Small Businesses Being Heard This Election Year? On Wednesday, the Republican vice presidential candidate Rep. Paul Ryan (R., Wis.) talked about how his hero was a small-business owner -- his mother. His mother started her own business at the age of 50 after his father passed away when Ryan was just 16. "She earned a new degree and learned new skills to start her small business. It wasn't just a new livelihood. It was a new life. And it transformed my Mom from a widow in grief to a small-business woman whose happiness wasn't just in the past. Her work gave her hope. It made our family proud," said Ryan. "And to this day, my Mom is my role model." 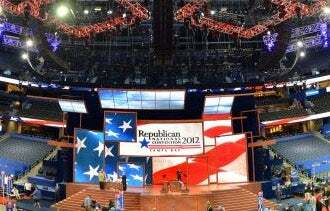 Other small-business owners were invited to speak throughout the convention. For example, Steve Cohen, president of family-owned construction and mining equipment manufacturer Screen Machine Industries Inc., traveled from his home state of Ohio to Florida. "It was a tremendous experience," says Cohen, whose business has fewer than 100 employees. Romney spent three hours at Screen Machine Industries about a year ago on a campaign stop, he says. About two and a half weeks before the convention, Cohen was invited to speak there. It was 17 days to be exact -- he says he counted down the days. During his time in the spotlight, Cohen talked about the need to protect intellectual property and limit regulatory burdens, critical issues for his Etna, Ohio-based small business. Another small-business owner, Bev Grey, spoke at the convention Tuesday night. Her trade-show marketing business, Exhibit Edge, employs 20 people and is headquartered in Chantilly, Va. She talked about the struggles and sacrifices involved in starting a business. "We risked everything and succeeded because of our hard work and commitment. What President Obama doesn’t understand is that when businesses grow, unemployment goes down and people thrive," said Grey. What were your reactions to the Republican National Convention? What are you hoping to hear from the Democratic National Convention? Leave a comment below and let us know.